Pop Century is known for its outlandish and oversized decorations that don’t necessarily provide the feel for a given decade, but certainly remind guests of what was popular in a given era. Tucked away in a corner of the 1970s is one such nod to a popular board game that really tied people up in knots! 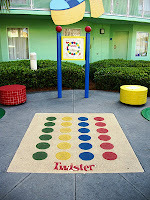 Twister was the invention of Charles F. Foley and Neil Rabens, and although Pop Century places the game in the 1970s section of the resort, it was actually created in 1966. That same year it skyrocketed into pop culture when Eva Gabor played the game on The Tonight Show with Johnny Carson. While controversy followed the game, and I’m sure no one here needs me to explain why, its popularity continued to grow throughout the next several decades. The intriguing part of the Twister game at Pop Century is that unlike other games featured around the resort, such as the larger than life foosball game, Twister is actually playable! The plastic mat has been recreated on a rubberized surface, similar to those found on modern playgrounds, and the spinner and board are hard plastic and waterproof. Need a good laugh after relaxing by the pool or on your way back to your room after a long morning in the parks? I can’t think of a better way to bring the family together than to tangle them all up together! 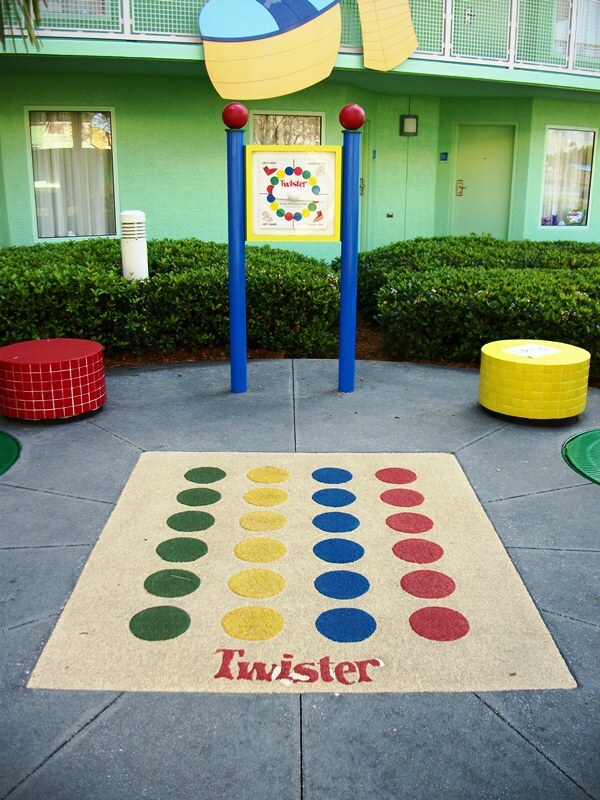 It may not be in the most accurate location, but Pop Century’s Twister most certainly deserves a spot amongst the icons of pop culture the resort represents. It will immediately bring back memories for guests, and perhaps help them create a few new ones! I had a Twister game back in the 60's. It was all such innocent fun back then! Adding it to the hotel grounds is pretty ingenious. I wonder how often it gets played there. Rich, it took me a while to get this photo as there were kids coming through and playing each time I passed by, so it seems to get some regular use.